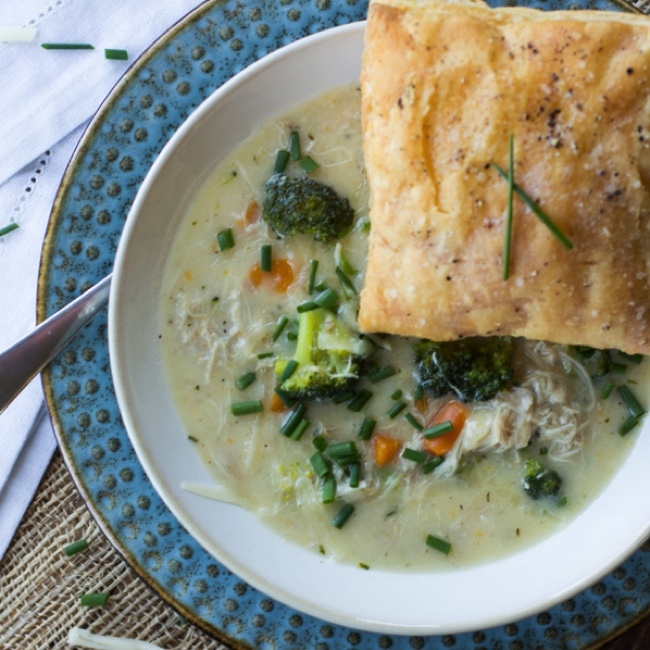 Instant pot cheesy chicken and broccoli pot pie is a combination of two of my favorite comforting classics: chicken pot pie and broccoli cheddar soup. It’s chock full of tender chicken, vegetables, and a thick cheesy gravy that is sure to warm you up on a cold day. Plus, it’s made super fast using the Instant Pot! Comfort food at its finest right here. 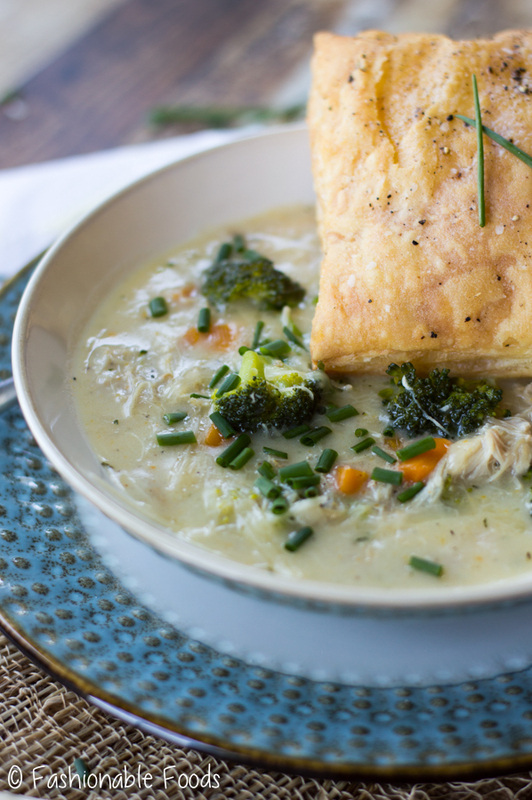 We’ve got a mash-up of two of my favorite cold-weather dishes: chicken pot pie and broccoli cheddar soup. Put ’em together and what have ya got? Cheesy chicken and broccoli pot pie. 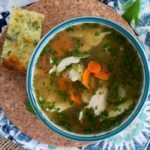 This pot-pie-soup combo is beyond delicious and super cozy, making it the perfect fall/winter meal. 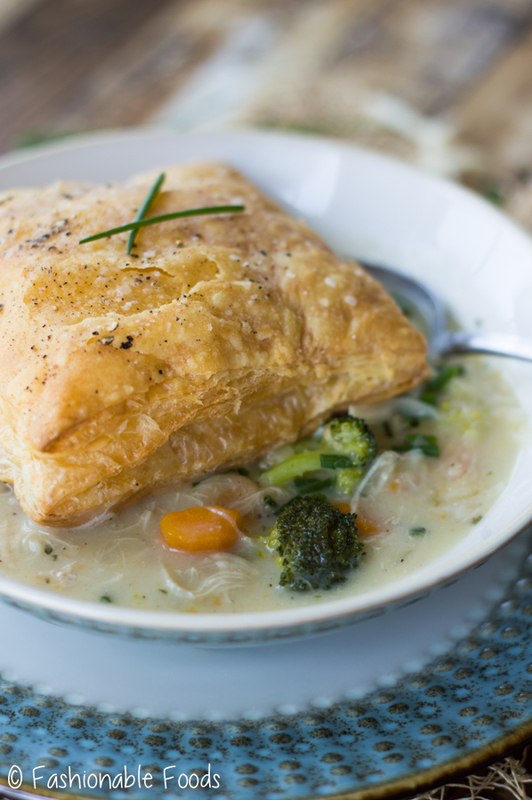 It’s chock full of tender chicken, veggies, thick cheesy gravy, and topped with a buttery puff pastry square. The best part? 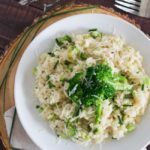 We can make this in about 45 minutes using the Instant Pot! I finally broke down and bought an Instant Pot. I resisted for a long time, but back during Prime Day the deal was too good to pass up! So I finally caved and jumped on the Instant Pot train. I’ve never been one that enjoyed these types of kitchen gadgets – just give me a pot and stove and I’m good. However, with a baby on the way, I need to think more about convenience! So here we are… and I have to say that I’m loving it. Chicken pot pie has always been a fall favorite of mine, but to get the best depth of flavor it required a lot of time. Simmering the chicken to get a rich broth, straining the broth and shredding the chicken, making homemade pie crust, baking, etc. It was a dish best saved for the weekend. We’ll start with boneless, skinless chicken thighs. I prefer thighs because they have SO much more flavor than chicken breasts, but if you’re not into dark meat you can certainly use chicken breasts. Toss your chicken pieces into the Instant Pot along with onions, carrots, garlic, fresh thyme, salt, pepper, and chicken stock. Secure the lid and press the “soup” button. Set the timer for 20 minutes. It will take a bit for the Instant Pot to come up to pressure before it actually starts counting down time, but you can use this time to get your additional ingredients ready! 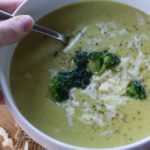 I like to add the broccoli at the end so that it retains its color and texture, so chop up your broccoli into bite-sized pieces and set it aside. Grate your cheese and set it aside and now you’re ready to make the roux and bake your puff pastry. Chicken pot pie has a thick gravy-like sauce, so in order to achieve that here we have to make our roux on the stovetop. It’s super easy and can be done while you’re waiting for the chicken to cook. Just melt butter in a small pot, add flour, and then whisk in a mixture of chicken stock and milk. It will get very thick and then you can just set it aside until you’re ready to mix it into the soup. 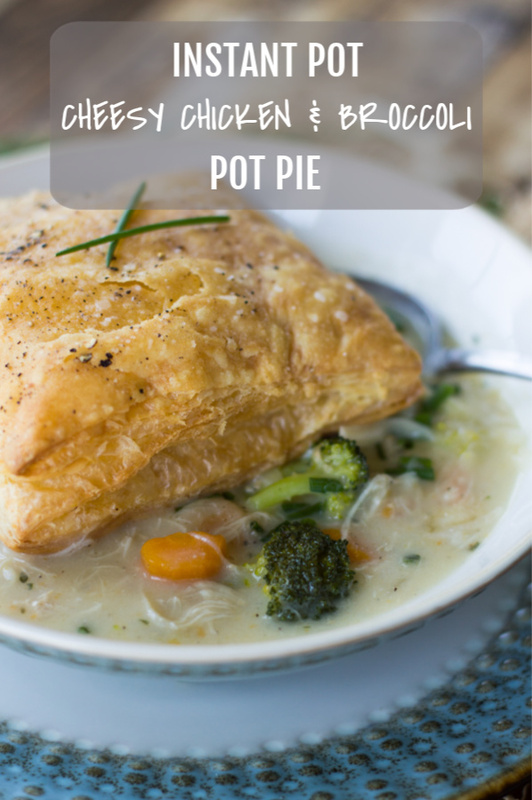 Traditional pot pie uses pie crust that is placed overtop of the yummy filling and then baked in the oven. We are skipping that step all together for a few reasons. TIME. Who wants to wait for it to bake?! 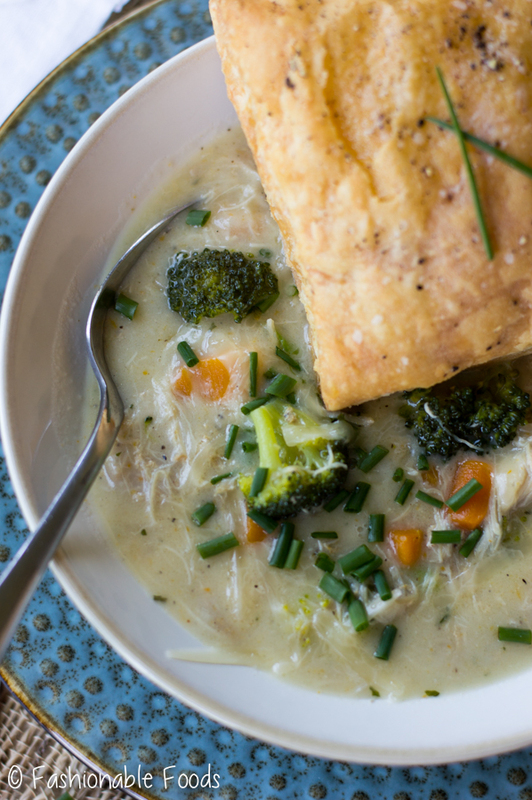 This is a mashup recipe of chicken pot pie and broccoli cheddar soup, so we’ve got the thick pot pie texture, but still kind of serving it like a soup. I personally don’t like how the underside of the pie crust ends up soggy with traditional pot pie, so baking squares of puff pastry and just adding it to the top retains the crisp exterior! Oh, and it’s insanely easy to buy frozen puff pastry and just bake it. 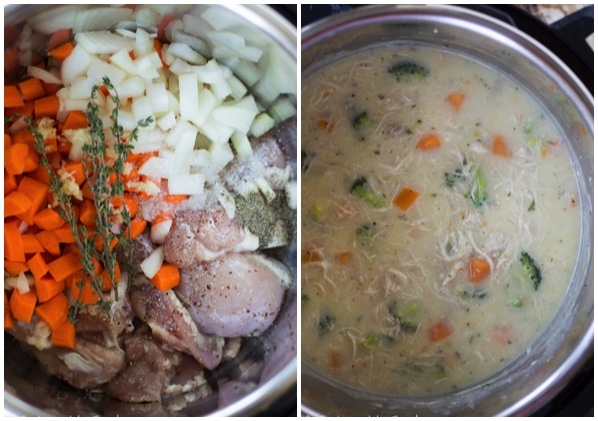 Once the chicken and broth are done, everything comes together really quickly. You’ll notice the chicken is really tender – you can basically just stir with tongs to break it up! Switch the Instant Pot to sauté and add in the broccoli florets and stir in the roux. Cook for another 5ish minutes and then add in the cheese when you’re ready to serve. Ladle the soup into bowls, top with more cheese, fresh chives, and then a puff pastry square. ? 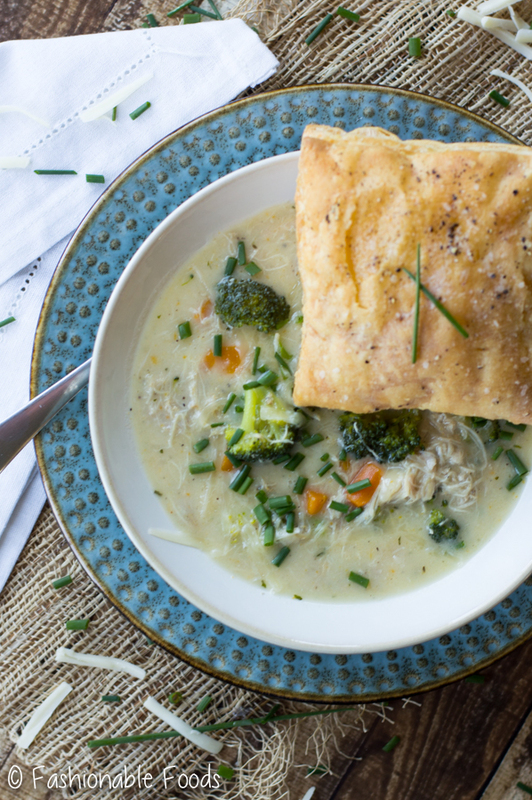 At this point, you’ll be thoroughly enjoying the comforting flavors of this delicious cheesy chicken and broccoli pot pie. Yum. ? Combine the chicken thighs, onions, carrots, garlic, thyme, salt, pepper, and chicken stock into the Instant Pot. Secure the lid and cook on the “soup” function (normal, high pressure) for 20 minutes and follow with a 10 minute natural release. While your soup is cooking, prepare the roux on the stovetop by melting the butter in a small pot. Whisk in the flour and cook for a minute or two before pouring in the chicken stock and milk. Cook on medium-low heat until the mixture is very thick, about 5-8 minutes. Set aside while you bake the puff pastry. On a floured work surface, roll each sheet of puff pastry a few times to seal the seams. Cut each into 4 equal squares, season with salt and pepper, and place between two baking sheets. Bake the pastries for 15-18 minutes or until golden brown and puffed. Once your soup is done and you’ve done a 10 minute natural release, remove the lid and check on the chicken. You can either pull the pieces out and shred them with a fork, or just break them up into pieces with tongs (they are super tender!). Turn the Instant Pot to sauté and stir in the broccoli florets and the reserved roux. Cook the soup for another 2-5 minutes or until nice and thick and the broccoli is tender. Turn the Instant Pot off and stir in the cheddar cheese until melted. Ladle the soup into bowls and top with more cheese and fresh chives. Top each with a puff pastry square and enjoy! Use a gum-free gluten-free all-purpose flour blend in place of the flour in the roux. Use your favorite gluten-free pie dough (store-bought or homemade) and cut out squares or rounds and bake. You could also use homemade gluten-free biscuits or even homemade puff pastry if you’re feeling ambitious!